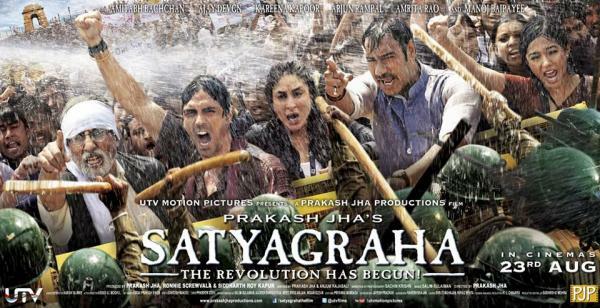 Satyagraha – A Review – Flawed, Cracked… But Rare! I happened to watch the movie in a theater here in Kuwait; I don’t usually watch movies in the theater. I wait long enough for them to be out as DVDs and then watch it from the comfort of an armchair at home. It so happened that considering I haven’t had much reason to complain against the movies Prakash Jha makes and that the star cast seemed decent (barring Kareena who can’t act and Amrita Rao, who I haven’t really had a chance to see in a role where she needs to act) I gladly went along for the movie. As soon as the movie started and I saw that there was a special thanks to Rupa Undergarments, I got the feeling that things are on the brink of a downhill tumble. I wasn’t disappointed at all. Not one bit. Apart from the shameless plug for everything from undergarments, tea and atta to ‘superior quality’ cement to ABP news channel (which I did not know even existed), the movie is a study in superficiality. It had the ubiquitous item number… a babe in ethnic clothes, low on the waist line and lower on the neck line, gyrating to a folksy tune set to a contemporary dance beat. Some earthy sounding lyrics and lots of latkas and matkas and dead-pan expressions were passed off as seduction. That very important requirement of a Hindi movie being catered to the viewer is thrown into the ‘plot’. There is this old masterji (Amitabh Bachchan), respected by the townspeople and a strong upholder of the truth, of what is right and what is just and his son who diligently tries to follow in his footsteps… then there is his wayward friend (Ajay Devgn) for whom the end justifies the means and who is fine with succeeding by unscrupulous means. There is the ‘sensible’ reporter (Kareena Kapoor Khan,making faces again) and this peppy girl-next-door (Amrita Rao, desperately trying to make any face that might register as an expression) is the upright son’s love interest. Add Manoj Bajpai in yet another variety role of corrupt politician and the stage is ready for some socio-political action. Oh, I forgot to mention Arjun Rampal in his very ‘different’ portrayal of a hot headed youth who hopes to make it big in politics… a la Rajneeti, maybeChakravyuh or I dunno… they are all different after all! Dadu Bachchanji pays homage to AnnaHazare with his aamaran annshan (fast unto death) and is bumped off anyway for his efforts! The Aam Aadmi Party is similarly represented by ‘Jan Satyagraha Party’. The characters are all farcical caricatures of some thread or the other of the current political fabric of India. None of the characters command any empathy from the audience and nothing onscreen can be related to with any sort of depth. It is like badly written fan-fiction about the Anna Hazare movement. The otherwise good actors struggle to make sense of the half-baked roles they have been given and the bad actors (the girls and the dude with long hair) are in no position to redeem themselves in anyway. Amrita Rao, in most scenes, appears to wonder what set of which movie she has walked into! Kareena tries to be strong and pull off something way beyond her acting skills. Gorgeous she is, emote she cannot. Period. I would say, Prakash Jha needs to wake up and smell the coffee… dig through the stories he has to say, make that sequel to Rajneeti he plans to do and erase this Atyagrahfrom his own and the public’s collective memory as soon as possible.